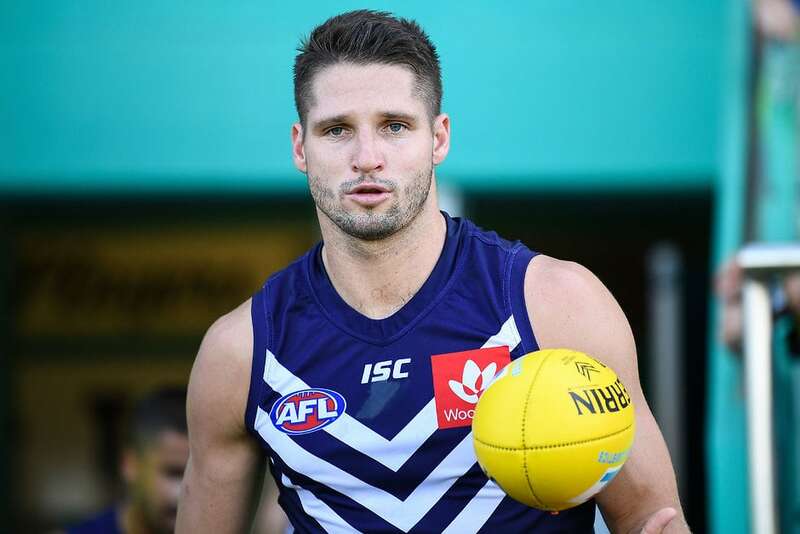 FREMANTLE coach Ross Lyon says suggestions boom recruit Jesse Hogan has been suspended by the club are "not completely accurate". Hogan was set to be unveiled as a Docker in Sunday's clash with North Melbourne, but has been ruled out as he manages clinical anxiety. The 24-year-old was unfit to train with his teammates at Optus Stadium last Sunday after drinking alcohol the previous evening, and his mental health issue has since been revealed by Fremantle. In a statement, the Dockers said Hogan's circumstances have "been shared with the club leaders and player leadership group" and there is no timeframe on his return to football. "In regards to 'suspended' with Jesse, that's not completely accurate. It's a mental health issue and Jesse needs support, and some professional support to work through and get him back available for playing," Lyon told Channel Seven on Tuesday night. Asked if Hogan was sidelined purely on medical grounds after being unable to train, Lyon replied: "I think you're trying to delineate between a mental health issue and some function that comes out of that. "I'm certainly not in a position to elaborate, except to say he really needs support. "We're really confident as a club we can give continued support for Jesse and we really respect the mental health space. "Because, really, we're a people business and we've done a lot of education on this and it's really foremost in AFL minds at the moment with all the pressures these young men are under." After missing both JLT Community Series games, out-of-favour forward Cam McCarthy is a chance to earn a reprieve against the Roos due to Hogan's unavailability and swingman Brennan Cox's four-week hamstring setback. However, the Dockers are also hopeful big man Matt Taberner will answer the SOS and be cleared to play two weeks after suffering a minor calf injury. "Matt trained really well on the weekend and we've noted all the way along that he's really KPI-based, so he's ticked some really good boxes," high performance manager Jason Weber said. "He's still got some requirements this week but unquestionably, he's heading towards having a chance to play this Sunday." Yet-to-debut goalkicker Hugh Dixon (hip) is also listed as a test, alongside wingman Bradley Hill (corked calf) and defender Griffin Logue (hamstring). Eight Dockers are battling soft-tissue complaints heading into round one, including Connor Blakely, who is five weeks away from returning from a serious hamstring tear. Small forward Sam Switkowski could be available in round two after his latest hamstring setback, while Aaron Sandilands (calf), Stephen Hill (quad), Bennell (calf) and Shane Kersten (foot) do not have return dates.